We are pleased to announce that Springs at West Chester has reached stabilization. Featuring 308 apartment homes, Springs at West Chester is located 20 minutes north of downtown Cincinnati, Ohio. Municipal requirements brought out our Best and Brightest mantra that had our teams back to the drawing board to redesign our prototypical buildings to incorporate urban design elements, including a flat roof and 42 lofted units into our development. Springs at West Chester started in 2014 with John Minahan, Director of Multifamily Acquisitions, and Sara Johnson, Senior Development Director, leading us through the difficult task of getting the project approved with city-mandated redesigns, land control, and entitlements. Larissa Addison, Corporate Counsel, handled the land purchase with a challenging seller. Luke Porath, Finance Director, and Larissa together led our land and loan closing efforts. Brian Strandt, Director of Construction, and Greg Cooper, Construction Project Manager, stepped in to the project midway through construction and ensured that quality product was delivered. Sherry Cameron, Regional Director, and Judd Bray, Community Manager, led our lease-up efforts. 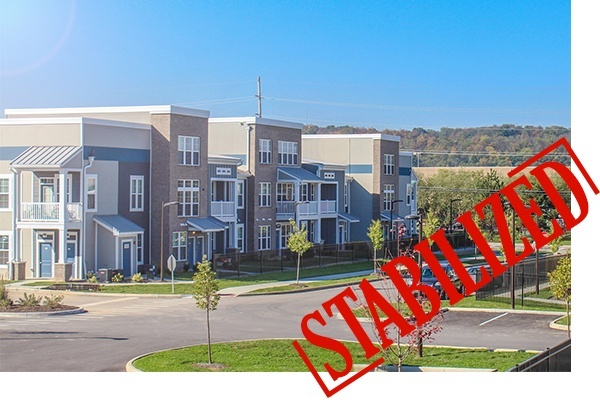 Congratulations to all who have worked hard from the conception of Springs at West Chester through the lease-up and stabilization processes! We offer a townhome-style approach to apartment living with wonderful, unique amenities. Our 24-hour fitness center opens up to our resort-style pool with a poolside grill. Open floor plan designs and granite counter tops, accompanied by stainless-steel appliances and freestanding islands, help make our apartment homes a great place to call home. Our 30 Day Pledge guarantees you will always receive the best customer service.